Shopify makes it easy for you to use an eCommerce website as simple as uploading a picture on Facebook or Instagram. Shopify has taken E-commerce to even the most technically challenged people making E-commerce more universal. All the operations in Shopify on a day-to-day basis might not require a lot of effort, setting up the shop might demand a lot of work and some technical expertise as well. The technical expertise comes into relevance, especially when customizing the themes and colors. The user Experience Part of E-commerce is what greets the eye of the end-user With the perspective of the user in mind, we design intuitive interfaces and color themes that are in line with your product and the emotion that your brand wishes to convey. We also give you ideas on how to make the interface better. There are a lot of payment gateway options that are available in the market and not all of them might be convenient for you or for your customer. We give a specialised advice in choosing the right payment gateway and also help you integrate it with the existing E-commerce interface. Our choices of payment gateways are based on your transaction volumes, the commission and the nature of your customers. We set up a system in place that will help you manage the Inventory of your products and also take care of the shipping of a product reactive to an order. We also give your assistance on how to overquote or underquote an inventory based on the frequency of your supply. Blogs are amazing ways to engage with your audience even on the website. In addition to giving a space for you to engage with casual content, it also presents a considerable amount is in terms of Search Engine Optimisation as the frequency of updation of a site is also one of the factors in ranking that particular site. Shopify gives you blog options but with the technical expertise of Claritaz, it is always possible to customize it and make your blog a reflection of your own brand in every way! Developing an eCommerce website has become one of the essentials of many businesses. With the diversity in the payment methods, the convenience of UPI platforms and the lucrative benefits that the online transactions offer in addition to the conveniences like the comfort of being at home and better pricing, it is important for businesses to leverage on E-commerce. In all of this, there were a few practical challenges when it comes to developing an E-commerce website. An E-commerce website mandated a few extra solutions in addition to the usual domain and hosting needs of a normal website. And E-commerce solution requires inventory management, inventory mapping to online availability, shipping and logistics solutions, return policies and a lot more of legal compliances. As much as this might seem like a long list it is quite possible that a single provider can cater to multiple clients for all the factors mentioned. With this advantage came a lot of plug-and-play E-commerce solutions where you could just buy an interface with seamless integration of payment gateways and Logistic solutions with their trusted partners. 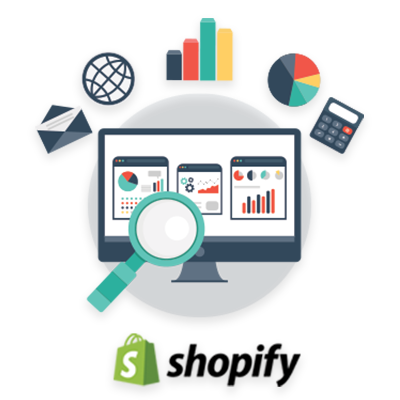 One such solution and the most widely used tool is Shopify. Overall, we take care to give you an eCommerce presence right from the scratch until the completion of your transaction with the user.